The Gi/o protein-coupled histamine H3 receptor is distributed throughout the central nervous system including areas like cerebral cortex, hippocampus and striatum with the density being highest in the posterior hypothalamus, i.e. the area in which the histaminergic cell bodies are located. In contrast to the other histamine receptor subtypes (H1, H2 and H4), the H3 receptor is located presynaptically and shows a constitutive activity. 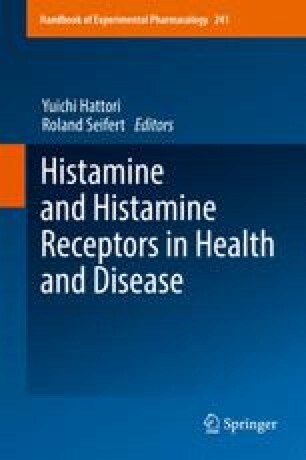 In detail, H3 receptors are involved in the inhibition of histamine release (presynaptic autoreceptor), impulse flow along the histaminergic neurones (somadendritic autoreceptor) and histamine synthesis. Moreover, they occur as inhibitory presynaptic heteroreceptors on serotoninergic, noradrenergic, dopaminergic, glutamatergic, GABAergic and perhaps cholinergic neurones. This review shows for four functions of the brain that the H3 receptor represents a brake against the wake-promoting, anticonvulsant and anorectic effect of histamine (via postsynaptic H1 receptors) and its procognitive activity (via postsynaptic H1 and H2 receptors). Indeed, H1 agonists and H3 inverse agonists elicit essentially the same effects, at least in rodents; these effects are opposite in direction to those elicited by brain-penetrating H1 receptor antagonists in humans. Although the benefit for H3 inverse agonists for the symptomatic treatment of dementias is inconclusive, several members of this group have shown a marked potential for the treatment of disorders associated with excessive daytime sleepiness. In March 2016, the European Commission granted a marketing authorisation for pitolisant (WakixR) (as the first representative of the H3 inverse agonists) for the treatment of narcolepsy.